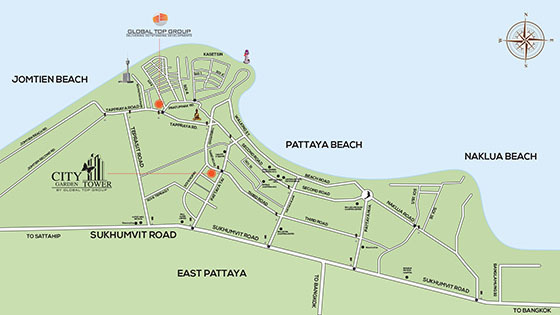 A luxury high rise 29-storey condominium by Global Top Group is in top location in Pattaya on 3rd road just approx. 200 meters from south Pattaya road. This condominium is being build by the best developer in Pattaya “Global Top Group” and Olympus City Garden just behind it are both in a strategically chosen location in Pattaya with easy access to Pattaya beach, Jomtien, access to highways via Sukhumvit road & close to shopping & entertainment. If vicinity to international schools & international hospitals is important then this location is for you and that also makes it a great investment as it is in a prime rental location. This condominium building has a total of 30 storeys with condos from the 4th floor offering great city views, sea views and view of Pattaya bay. Swimming pool, fitness center, children’s playground, Sauna, Restaurant and shops, 24 hour security with CCTV camera system & electronic keycard entry system, 1st & 2nd floor will have shops & commercial areas with no need to leave the building if you don’t want to. Studios, 1 bedroom condos & 2 bedrooms condos are still available for sale but selling fast. Talk to our sales agents by submitting the form below to decide which condo purchase or easy payment plan is the best for your needs.